The main PA is fed from the Main outputs on the Eleven Rack (balanced XLR outputs), while my monitor gets its signal from one of the ”output to amp” jacks (set to ”Rig output”). In the 11R, you can set the front-panel volume control to affect only the ”output to amp” jacks, so I can set and adjust my stage level independently of the signal being fed to the PA. This is quite important – having huge volume jumps when you change patches will quickly drive the soundman (and probably the audience too) nuts. 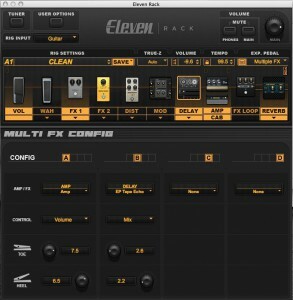 I set my 11R up so the ”Rig volume” setting stays the same on all patches. It’s currently set at -6dB, but you could just as well set it to -10 or -15dB if you want, to leave a little more wiggle room in the mixer (the XLR outputs on the 11R carry a proper, true, line-level signal). Either way, make sure you stick to that setting and never change it, unless you’re prepared to make that change on all patches. Any volume adjustments to level-match patches are then made using the ”Amp Out” control (not to be confused with the ”Out to Amp” controls). That way, any volume adjustments I make to a specific patch will be the same both in the monitor and through the PA.
To get a reference, I set up a basic clean-ish Fender Twin Reverb and adjusted its ”Amp Out” control to 0dB. Whenever I make a new rig, I can always go back to that basic clean sound to help me find the right volume setting for the new rig. Also, as mentioned earlier, the XLR outputs do carry a proper line level signal. This is normally a good thing – padding it down to mic level just to re-amplify it back up to line level in the mixer’s mic preamp will inevitably result in more noise. But while it helps in the noise department, a signal that hot can be too much for some mixers to handle through the regular mic inputs. If the mixer doesn’t have a ”pad” switch to help out, there’s often a 1/4″ TRS line input you can use instead of the XLR. For that purpose, I always keep an XLR->1/4″ TRS converter handy, just in case the soundman doesn’t have one available. In general, though, it’s not a problem, and any soundman worth his/her salt will know what to do with a hot line signal, and will also carry whatever tools needed for the job. Case in point – so far, I haven’t had to whip out the converter cable. But it feels good to know I can, if need be. With instant access, I can preset the basic clean rig with only the effects I want on at the start turned on. The IA buttons on the pedalboard will then let me turn additional effects on (or off, if it’s something that was programmed ”on” in the preset) on the fly. Hitting the preset button will instantly get me back to where I started, or to any other preset I want to call up. To the right, you can see a basic clean preset I’ve cobbled together. I actually did most of the work right on the 11R (it is that user-friendly! ), but thought it’d look nicer to take a screen shot of the editor in ProTools. As you can see (at least if you click the image to view it in proper size), it is a Super Reverb amp model with a 4×12″ cab. 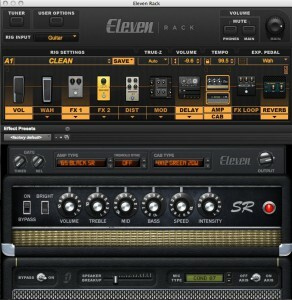 There’s a compressor, phaser, overdrive, chorus and tape echo in front of the ”amp”, followed by reverb. The compressor, delay and reverb is on at the start, while the other effects can be kicked in at will. This type of setup lets me get away with just a few preset rigs, and still get much more flexibility than my current pedalboard/amp setup. 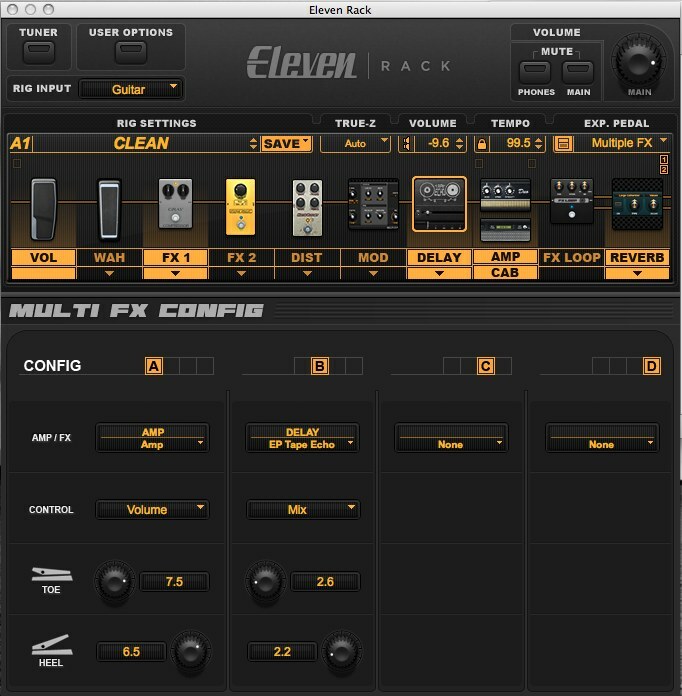 The Eleven Rack – like most modellers out there – comes with a multitude of simulated speaker cabinets to ”plug” your equally simulated amp into. And you can set the unit up so that when you select an amp, it automatically also selects the most appropriate cabinet for it (so a Twin Reverb comes with an open back 2×12″ while a Plexi Marshall comes with a closed back 4×12″ with Celestion Greenbacks). 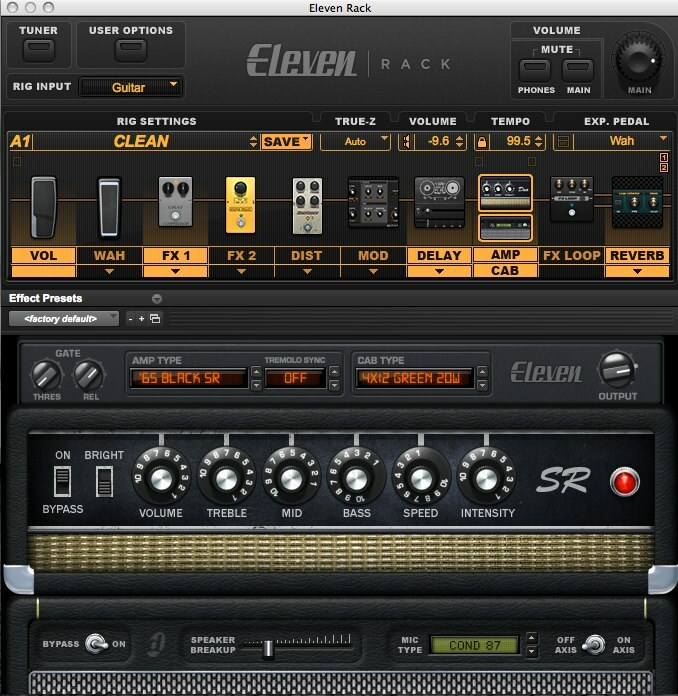 Don’t be afraid to go outside the box – in the example above, I used a Super Reverb with a 4×12″, for instance. However, for live use, I did find the 4×12″ cabs a bit too much, so I switched to a closed back 2×12″ instead – it has a similar vibe, but a more focused sound. Actually, I use that cab for almost all sounds when playing live, which ties in to what I said earlier about setting the levels. You can easily deal with volume changes between patches when you’re recording, but for live playing, getting the volumes just right is essential. Likewise, I found that the jump from a closed back 4×12″ to an open back 2×12″ or 1×12″ when switching from a Marshall to a Twin or Deluxe Reverb also made for a too big change in a live mix. I find it much easier to go with one cab for all the basic rigs – sometimes, I’ll use a different cab as a speciality thing (if I’m going for the Neil Young ”about to explode” tweed Deluxe sound, for instance). But my basic clean, grit, crunch and lead sounds all use the same cab and mike. And since I felt the 4x12s – while sounding awesome in isolation – were just too fat for a live mix, I ended up with a simulated Bogner 2×12″ with Vintage 30s. Using the same cab for almost all tones really helps the rig ”sit” just so, and stay consistently there, in the live mix. Again, for studio and recording work, I’ll happily experiment wildly. But those finer nuances rarely transfer to the live setting – I find that there it is better to provide a more consistent sound. One tip when going mono… don’t switch the rig over to ”mono” mode. You can do that if you want, but any stereo fx present will sound strange due to phase cancellations. It’s better to just use the L or R output, and obviously stay away from too wide stereo fx (like ping-pong delays etc), as they will not be reproduced correctly. That tip goes for just about any stereo signal, by the way – summing to mono is almost always a bad idea. And if you do use stereo (be it a guitar rig or keyboard), make sure the sound engineer doesn’t feed both channels back to the same stage monitor – again, that will cause weird phase cancellations. You can feed the L side to one of the AUX sends and the R side to another, but don’t be tempted to feed both sides through the same system. Side note: this is something I’ve found essential with my Nord Piano 2 – when using both outputs, the piano samples absolutely have to be panned fully L/R, otherwise the piano will sound strange. And of course, in live situations, care needs to be taken to never send both channels to the same stage monitor. What about the reverb, then? Sharp-eyed readers may remember that in the preset rig presented above, I did have the reverb on. So how does that tie into what I just wrote, one might ask? Well, again, I’m not after a large room simulation – having double rooms (one simulated in the modeler, and a real one at the venue) is one of the reasons many people get lost in the mix when trying to use modelers live. And it’s a double problem: using too much fx in general not only causes you to get lost in the mix – you’ll also eat up valuable sonic space (that would have been used by other instruments), messing up the whole mix in the process. 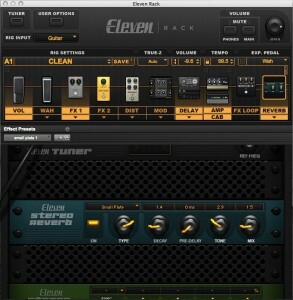 I still use a splash of reverb nonetheless, but only enough to get a little ”air” around the guitar. You can see the basic settings to the right – in this case, it’s a small plate reverb with quite short decay and the mix just above ”barely audible” 🙂 With the clean sound, I’ve also had good times using the spring reverb model in the 11R – again set quite short and with the mix low, it really adds to that ”Fender amp” sound and feel. Use an effects block to boost – this one is also real simple. 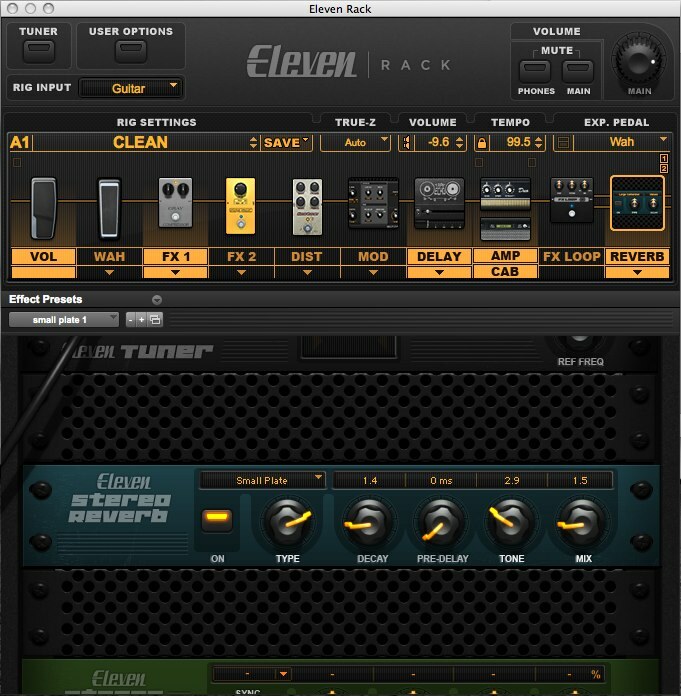 Add a graphic EQ after the amp/cab block, and use it to raise the level the desired amount. Using instant access, you can then turn it on/off at will. Use Multi-FX control with an expression pedal. This is a really neat trick in the 11R. You can use an expression pedal to seamlessly go from your base settings in any given rig, to an alternate setting (in this case one better suited to lead playing). and with Multi-FX control, you can adjust up to four parameters simultaneously, on the fly. To the right, you can see one setting, where I’ve made the expression pedal raise the amp’s output level and the delay mix. As a baseline, I set the ”heel” value to the numbers already programmed, but on some presets I actually have it a bit lower than the programmed normal value. That way, I get the normal level as soon as I go to that preset, while the expression pedal lets me turn the level both up or down to suit the moment. Hitting any other preset (or the one I was on) brings the settings back to their programmed values, regardless of how the expression pedal is set. Don’t expect settings that worked great in the studio to translate directly to a live scenario. I’ve found that some of the great recording sounds have too much low end and too little midrange to cut it live. I had a clean sound based on a Super Reverb through the Classic 30 4×12″ cab, that sounded superb when recording. When I took the rig to a live setting, though, it didn’t work at all. A Twin Reverb (cleaner, less midrange) into the B30 2×12″ cab worked perfectly, though. I did the same thing with the AC30 preset – simply switching out the 4×12″ cab for a 2×12″ made it sit just so in the live mix. The solution is obvious – when creating presets, try to use the same type of setup and circumstances as where you will be using them. If you’re creating a set of virtual rigs for live playing or rehearsals, use a PA monitor at reasonable volume. That will get you in the ballpark. If you’re tweaking sounds for the studio, listening through a pair of studio monitors will help a lot – especially when trying to find sounds that will translate at normal hi-fi listening levels. And obviously, trying the sounds out in their intended environment (i.e. within the musical context) is essential.